Shoves, kicks, and slurs were exchanged this morning when the Rios and Pacquiao camps crossed paths between training sessions at The Venetian Macau ahead of this weekend's fight. Hall-of-Fame trainer Freddie Roach got into it with his counterpart Robert Garcia as well as several members of Rios's entourage, include Alex Ariza, who used to work with Roach. 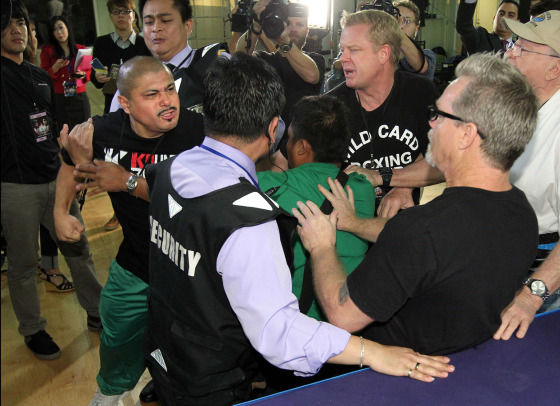 With the 24/7 cameras on-site for the melee, Thursday night's finale of '24/7 Pacquiao/Rios,' airing at 10 PM ET/PT, just got even more interesting.